Parts and attachments included are batteries, battery chargers, chiseling tools, dies, drill bits, drill chucks, driver bits, dust collection systems, grinding discs, hammer heads, sanding belts, sanding pads, and saw blades. US demand for power tools is forecast to rise 3.9% annually through 2022. To capitalize on growth, it is important to recognize the key factors driving increases and the markets in which their impact is strongest. This report encompasses electric (plug-in and battery-powered), pneumatic, and other (hydraulic, powder-actuated, and engine-driven) portable power tools, parts, and attachments for them that are used in a variety of applications. Corporate annual reports, SEC Form 10-K filings, product catalogs, and other company information were also used extensively in framing the industry and market environments and as input for market size assessments. Professionals seek out cordless power tool when going to purchase. Changing behaviors of women are seeing them use more power tools now than ever before. As more content like how-to videos are added online, a growing number of people are seeking to do their own DIY projects. How is the power tools economy responding to these trends? More technological advances are being made to extend the line of cordless power tools. Places like Home Depot are adding classes specifically aimed at teaching women to become hands-on learning. Online outlets are providing practical instruction and support the new DIY ethic. One-quarter of the population reported buying a power tool or accessory in the last year, reflecting the popularity of power tools among the population, as well as increased purchase rates in 2017 amid sanguine economic factors. Consumers living in rural or suburban areas were more likely to purchase power tools, as they are more likely to live in houses rather than apartments or condos that may have restrictions on home customization. This Study will report more details on age of consumers likely to make these purchases by home environment, gender, age, marital status & children. Where are the Best Opportunities for Growth? Electric power tools are more popular than pneumatic tools, but both have opportunities for growth, especially in the professional market. As far as international trade, China is the largest source of US power tool imports due to the country’s lower labor costs and extensive manufacturing infrastructure. 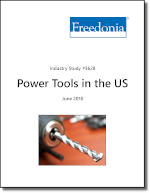 This Study provides a more thorough analysis of opportunities by electric power tools, pneumatic & other power tools, markets, and distribution channels. Table 2-4 | Consumer Purchases by Product: "Please indicate which power tool(s) or power tool accessories you bought in the last 12 months." Table 2-6 | Consumer Purchases by Type of Store: "Where did you purchase the power tools or accessories?" Table 2-7 | Consumer Purchases by Research Source: "What materials did you use to research the tools before your purchase?" Table 2-8 | Consumer Purchases by Source of Research: "Which source of information was most helpful in deciding which tool to purchase?"